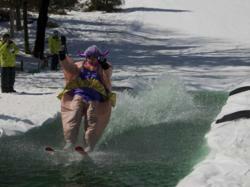 Costumes required at Mount Snow's Sink or Skim! The mild weather may be a bit early this year but skiers, riders and party goers alike won’t be complaining this weekend, March 23-25, at Mount Snow’s Bud Light Reggaefest where island music will fill the air and crazy events will keep the crowds entertained both Saturday and Sunday. This annual event traditionally draws thousands of people to the Southern Vermont Resort to enjoy one of the final big parties of the winter season. Live reggae music will begin Friday night, March 23 at Snow Barn with performances from DJ Selectah Niko, Spiritual Rez and J Boog. Saturday will feature Wolfman Conspiracy on Cuzzins deck starting at 1:00pm and Saturday night the music returns to Snow Barn where DJ Selectah Niko, Wolfman Conspiracy and Thunderbody will keep the crowd dancing. Rounding out the weekend of live music on Sunday will be a performance from Thunderbody out on Cuzzins deck. Those events include the 10th Annual Sink or Skim Pond Skimming Contest which will take place on Saturday in the Main Base Area. A 100-foot long manmade pond is dug into the snow and up to 125 competitors, costumes required, will speed down the final pitch of the Exhibition trail and attempt to skim all the way across with huge crowds cheering them on and a 2012/2013 season pass on the line for the winner. Sunday will feature Duct Tape Derby V where participants can register a sled made only of cardboard, duct tape and zip ties to slide down the tubing hill with prizes being awarded to best slider, most creative, judges choice and most unique. For more information on Mount Snow’s Bud Light Reggaefest visit mountsnow.com.